Nov 8 (AZINS) Delhi's air quality worsened through the day and went off the charts by the evening as the city recorded its worst quality air of the year the morning after Diwali, authorities said Thursday. On Thursday, the PM2.5 (particles in the air with a diameter of less than 2.5 micrometres) level was recorded at 492 gm-3, more than eight times the permissable limit. The PM10 (particles in the air with a diameter of less than 10 micrometres) level was recorded at six times the permissable limit at 618 gm-3, according to the SAFAR. India's official permissible PM2.5 limit is 60 gm-3, while that of PM10 level is 100 gm-3. Ultra fine particulate pollutants PM2.5 and PM10 in the air pose health hazards as they can enter the respiratory system and reach the bloodstream. Twenty three areas in Delhi recorded "severe" air quality while eight areas recorded "very poor" quality air, according to data of the Central Pollution Control Board. A "severe plus emergency" level AQI essentially means that even healthy people may suffer from respiratory illnesses on prolonged exposure. This air will seriously affect those with ailments, according to the advisory issued by the SAFAR. 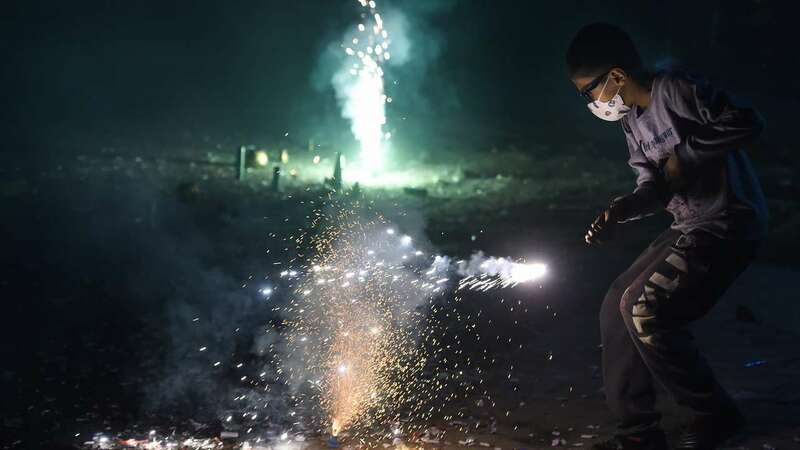 Delhi's air quality is expected to remain in this category over the next two days as the smoke emitted by fire crackers has slowed down the process of pollutant dispersion, the agency said. The Supreme Court has allowed bursting of firecrackers from 8 pm to 10 pm only on Diwali and other festivals. The top court also allowed manufacture and sale of just "green crackers" which have low emission of light, sound and harmful chemicals. The court said the police should ensure that there was no sale of banned firecrackers and in case of any violation, the Station House Officer (SHO) of the police station of the area would be held personally liable and this would amount to committing contempt of the court. Despite the order, certain places recorded violations where firecrackers were burnt before and after the set time frame. These included Mayur Vihar Extension, Lajpat Nagar, Lutyens' Delhi, IP extension, Dwarka and Noida Sector 78. The police admitted that violations were observed and it would take serious legal action against the people violating the apex court order. They said they were continuously patrolling the areas to check for violations.